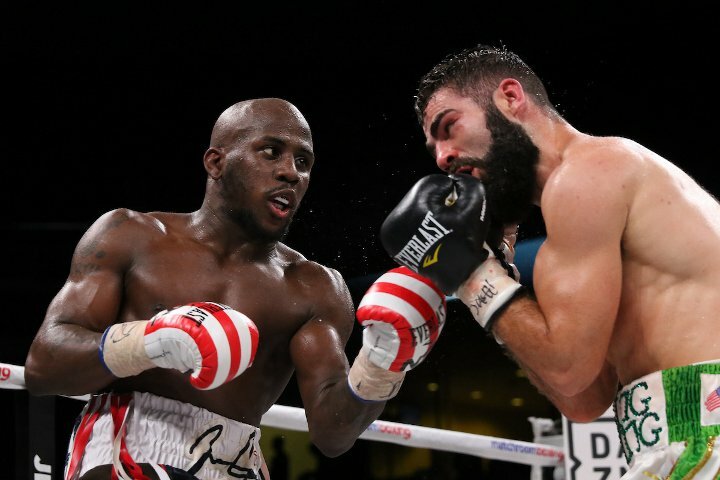 IBF super featherweight champion Tevin Farmer 29-4-1 (6) turned back the challenge of the tough Jono Carroll 16-1-1 (3) at the Liacouras Center in Philadelphia on Friday night. All three judges awarded the bout to Farmer by scores of 117-110, 117-111 and 117-111. Ireland’s Carroll, 26, looked to establish himself on the inside, whacking away at the body with a two-fisted assault. Farmer retaliated with sharp counterpunches, opening up a cut over Carroll’s right eye in the third frame. The 28-year-old southpaw champion took over in the mid-rounds, sending Carroll’s mouthpiece flying into the crowd at one stage. Farmer turned in on in the championship rounds, leaving Carroll reeling from a jarring shot in the eleventh and finishing the fight strongly in the twelfth. “It was a good performance. Even when I am at my best, I will think I need to improve. He talked a lot but he showed up. That was a great fight,” Farmer said. Farmer is targeting a unification fight against WBA super featherweight champion Gervonta ‘Tank’ Davis 21-0 (20), a fight that has been brewing for a number of years. “Honestly, I don’t care. I handled business tonight. We go back behind the scenes and we will talk,” Farmer said.